Carnival of the Animals is a set of 14 pieces of music by composer Camille Saint Saens. These pieces are performed with two pianos and several other instruments. The composer was so clever in creating each piece to represent specific animals like lions, cuckoos, chickens, elephants and more. The pieces either imitate the sound of the animal or create a musical message that you can associate with that animal. 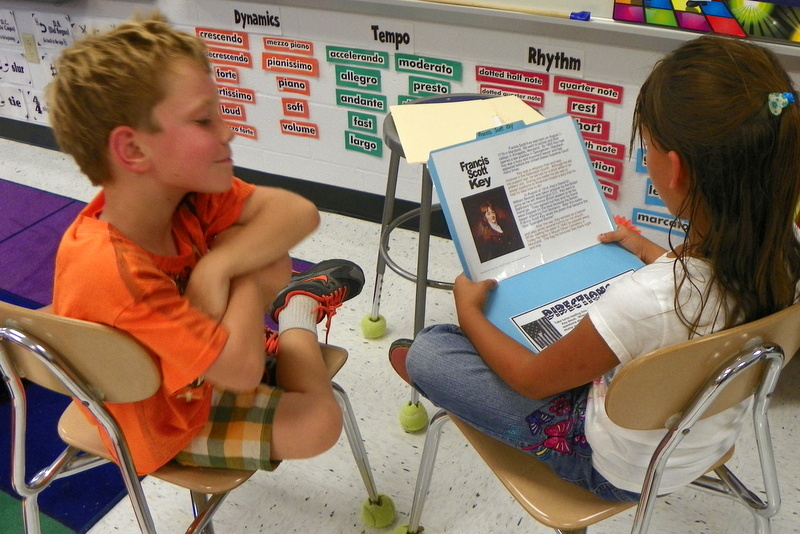 In second grade we use this unit to discuss composing and to identify instruments. 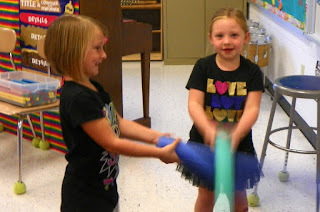 After watching a video introduction to Carnival of the Animals students worked in workstations to practice music skills, read about Saint Saens and review the music of Carnival of the Animals. 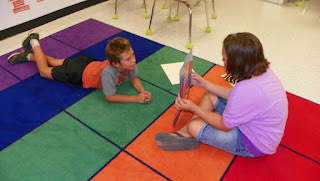 At the reading workstation students had the opportunity to read about each of the pieces in Carnival of the Animals. At the SmartBoard students listened to several of the pieces and then classified them by sound (dynamics, tempo, etc...). 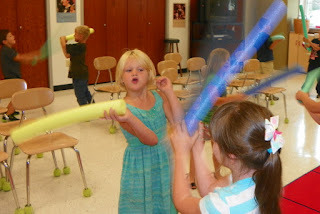 At the Aquarium Station students created "schools" of rhythms. Together with their group the arranged rhythms and performed them with body percussion. At the Coloring Station students colored a picture of the piece "Royal March of the Lion" by using a special key and identifying notes. 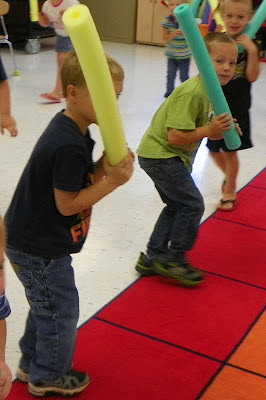 Building long lines of rhythm and performing them with a partner was great fun. Some of the rhythm-a-pillars stretched way off the carpet! 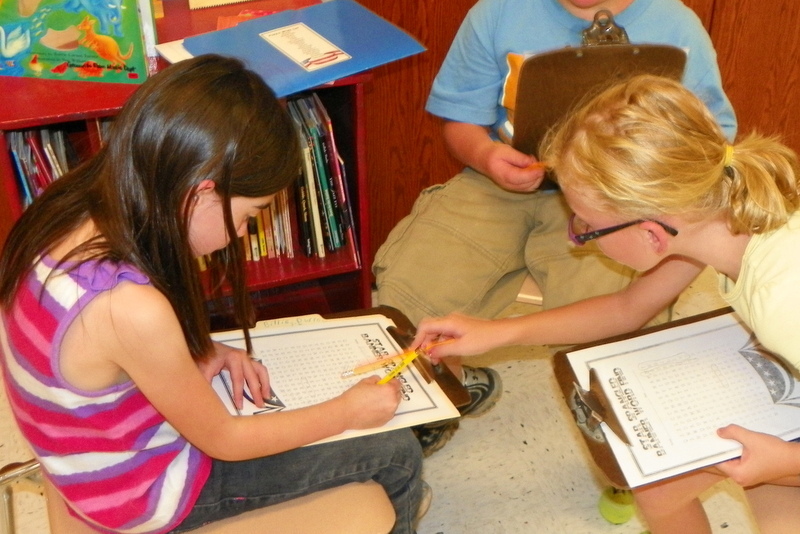 At the iPad station students worked with a partner and a funny giraffe named Gina to practice beat keeping. You can hear music from Carnival of the Animals HERE. Get lots of fabulous Carnival of Animals worksheets, listening logs, crafts and a bulletin board HERE. September 14 was National Anthem Day and September 17th was Constitution Day. 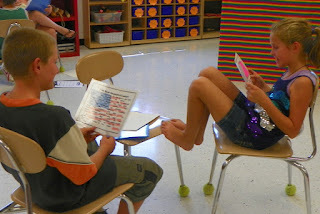 In third grade music we've been working on learning the "Star Spangled Banner". We've learned about the writing of our national anthem and a little about its history. We've learned the lyrics (well...we're STILL working on that!) and the meaning of some of the words in the lyrics like "perilous", "gallantly" and "ramparts". To achieve these goals we've been working in Star Spangled Banner workstations. 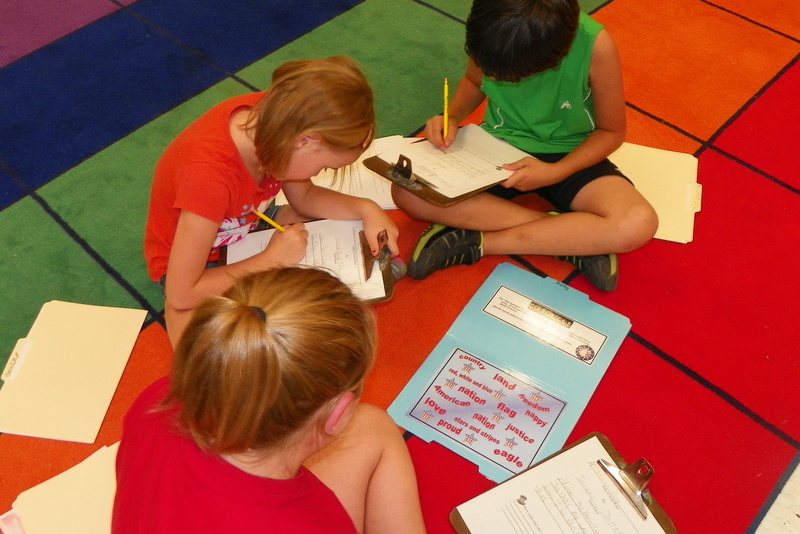 These workstations allow students to work on independent skills cooperatively. Listen to the Star Spangled Banner HERE. Learn about the National Anthem Project HERE. Teachers: Star Spangled Banner Workstation Kit is HERE. I Sang By Myself Today! We love to celebrate in the music room! We celebrate holidays, birthdays, unbirthdays, silly days (Have you ever celebrated Talk Like a Pirate Day? FUN! ) and ordinary and extraordinary days. 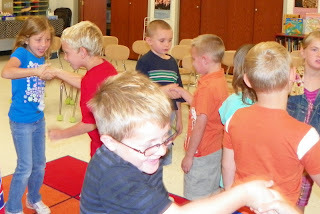 Last week 1st graders had to opportunity to sing all by themselves in front of their classes. 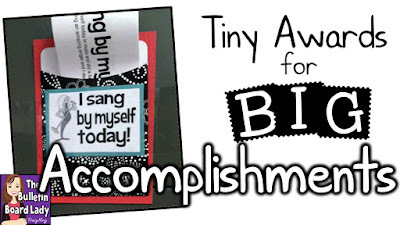 This takes a lot of courage and every one who sang received a special "I Sang By Myself" certificate! The rest of the class listened quietly and displayed audience behavior (quiet, eyes on performer, hands on the lap) ending with applause at the end of each performance. Here are some pictures of these adorable certificates. I make quite a few copies and keep them in these library pockets. The pockets are taped to a cabinet at the front of the room. 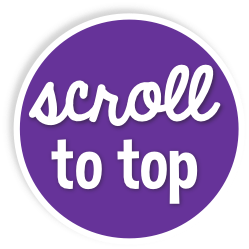 This makes them easy for me to access and it also serves as a reminder to reward my kiddos. Sometimes we get so busy making music that we forget to celebrate. 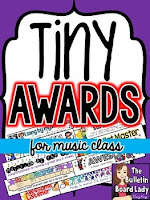 There are several certificates that students can earn in music class including The Awesome Listener and the Super Singing awards! These tiny award certificates are incredible motivators even for my 5th and 6th graders! Although this batch was printed on white paper, I often print them on colored copy paper and sometimes even print them in full color. 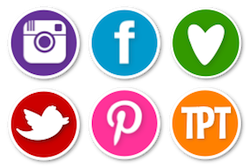 Students wear them as bracelets (with a paper clip or quick staple to hold them in place) or take them back to their classroom and tape them to their desk. I always encourage them to take them home so mom and dad can celebrate with them, but sometimes they have other ideas! You can grab an updated version of these tiny awards HERE. 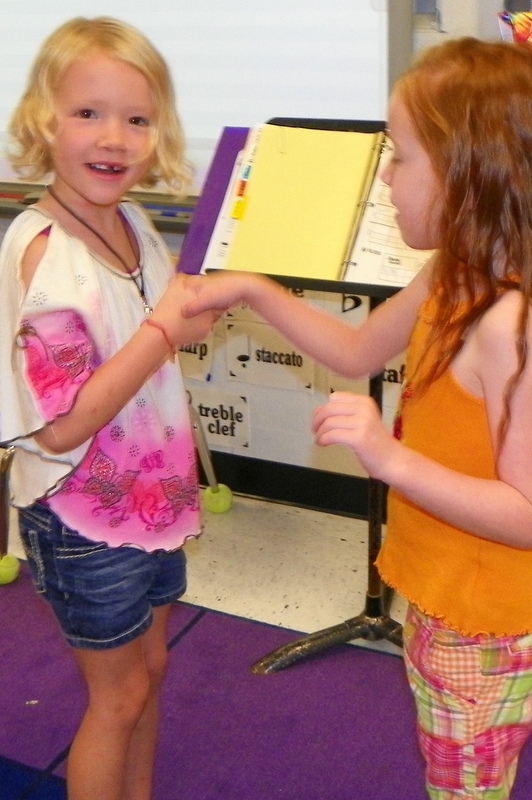 First Graders shake hands to the beat while singing "Hola Amigos!". For a limited time an anonymous donor has agreed to MATCH every donation made! This means that we are a little over $200 away from meeting our goal! CLICK HERE to learn about our current project. I love the books and Brown Bear, Brown Bear What Do You See? and Polar Bear, Polar Bear What Do You Hear? Recently some first and second graders used Polar Bear as a springboard for composing. First we read the book and then added sound effects. Next we used ZooPal plates to create an animal sound song on our beautiful carpet. Since music is really just organized sound, this activity is a great way for beginning composers to get started. 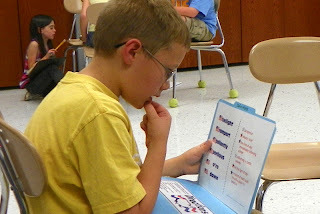 As a group, students picked out a sound to represent the animal on their plate. Then we arranged those sounds by placing them in one of the squares on the rug. Once our song was complete we performed it. What a growlin', howlin', buzzin' good time! Next we took a 16 beat grid and composed individual animal sound songs. The bulletin board outside the music room uses animal sounds and rhythm patterns and asks "Children, children what do you hear?" Get the book here: Polar Bear, Polar Bear, What Do You Hear? It's been such a great week in Kindergarten and First Grade Music! 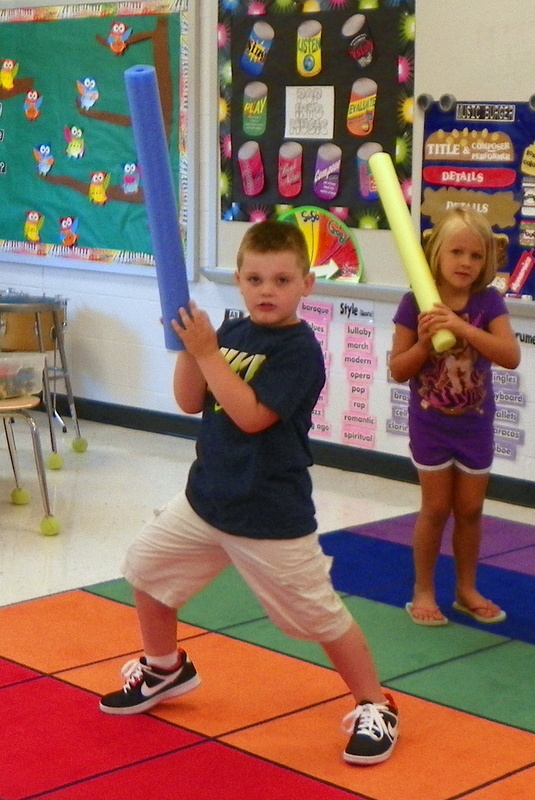 We've been experiencing steady beat with steady beat swords. The "swords" are actually swimming noodles that have been cut in half. First we listened to "Imperial March" from Star Wars and found patterns in the music that sounded like we should march, swing our steady beat swords and sneak around. Then we kept the steady beat by clapping one hand with our partner. Next we took that skill and transferred it to our steady beat swords. 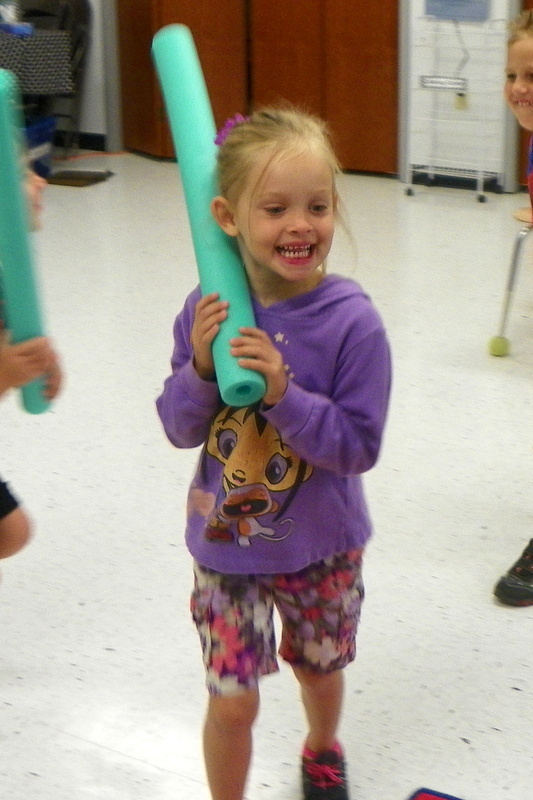 We clicked our steady beat swords together on the beat with our partner. As we listened to the song the next time we marched, light saber-ed to the beat and snuck around the galaxy in search of a new beat keeping partner. What fun! Read another blog post about steady beat swords HERE.